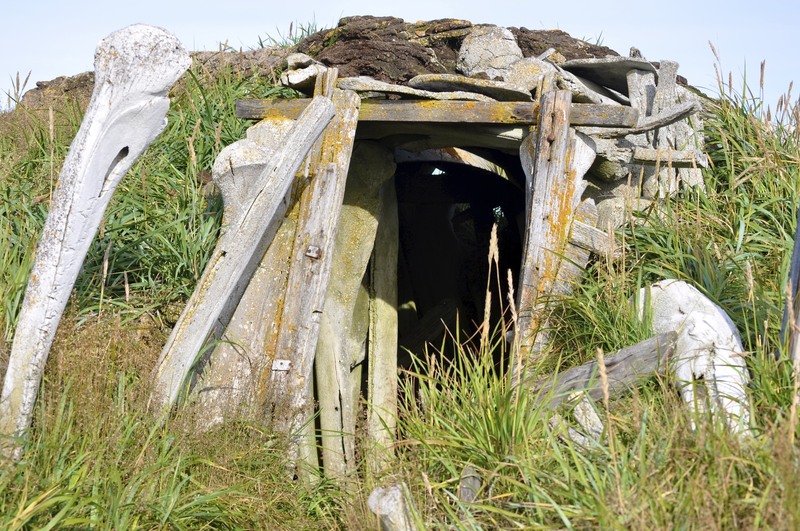 This semi-subteranian sod, driftwood and whalebone home was the last such structure to be inhabited in the old village of Tikigaq on Point Hope. It was abandoned in 1975, and by that time was hooked up to electricity. Prior to electricity, these homes were illuminated and heated with seal oil lamps and are reported to have been quite warm. Near the homes, people dug cellars which served as year-round deep freezers. Caribou, seal, walrus and whale bones are scattered across the grassy tundra, and where people once lived now ground squirrels make their homes. Much of the land that was once inhabited has long since been washed away as generations of winter storms have eroded the peninsula. There have been times when polar bears have used structures in the old village as temporary winter dens. Snowy and short-eared owls, which hunt by day, along with marsh harriers keep the squirrels and voles in check. Wow..imagine living in this..interesting history. Hi Barbra & Jack, I thought I was remote having a 5 mile trip to the nearest shop, but I’ve just seen Point Hope on Google Earth, and it looks as though you could, on a warm day, take a swim to Russia. Beautiful spot. Wonderful life. And thanks again for liking my pasta post. You might also like my bread recipe (just below the pasta). This is genuinely easy and gives the best bread you’ll ever taste. I’m looking forward to reading future posts. Thanks Bill. We’ll definitely give the bread recipe a try!